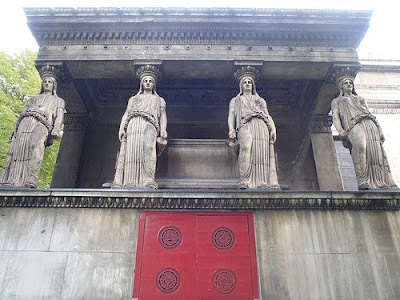 On the north and south sides of St Pancras Parish Church, four huge female caryatids support the protruding vestries of the church, in a design by father and son William and Henry Inwood which draws inspiration from the Erechtheum in Athens. The figures were, modeled in terracotta around cast-iron columns were, we are told, originally too tall for the space and slices had to be removed from their middles to fit them into the space, but they still look very impressive. The terracotta used for these is a special formula developed by Eleanor Coade in the early 19th century, now usually called Coade Stone.